The last ship to be built for the White Star/Shaw, Savill & Albion joint service to New Zealand, Zealandic was launched at Harland & Wolff, Belfast, in June 1911. Her maiden voyage from Liverpool to Wellington began on 30 October of that year. 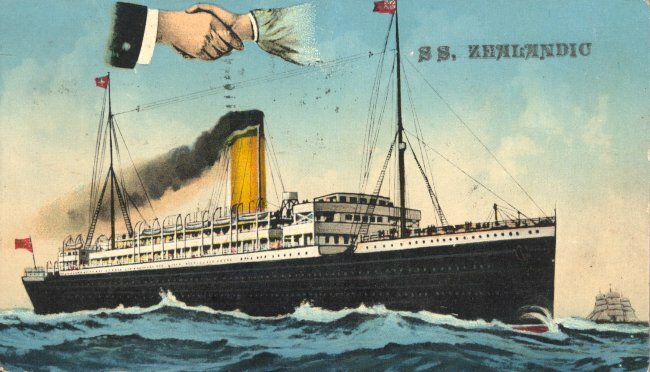 In addition to her regular service, Zealandic was chartered for a time in 1913 as an immigrant carrier for the government of Western Australia. From 1917 until 1919, Zealandic was operated by the Shipping Controller under the Liner Requisition Scheme. When she returned to White Star service after the war, her route was changed; the return from Wellington, which had previously been around Cape Horn, now ran through the Panama Canal. In 1926, Zealandic was placed on a joint service to Australia, operated by White Star with the Aberdeen and Blue Funnel Lines. (Ceramic, Suevic, Medic and Runic (II) were also placed on this service.) Zealandic (renamed Mamilius) was chartered and operated by the Aberdeen Line, which also contributed Herminius to that joint service. When White Star merged with Cunard in 1934, the ship was transferred to Shaw, Savill & Albion, together with White Star’s Australian service, and was renamed Mamari. She remained in commercial service until 1939, when she was sold to the Admiralty and converted into a dummy version of the aircraft carrier Hermes. On 4 June 1941, she was on her way to Chatham, to be reconverted to commercial, when she was attacked by German aircraft. In trying to evade their attack, she hit the wreck of the tanker Ahamo, near Cromer, and was beached. She was then torpedoed by an E-boat and abandoned as a total loss. Sources: Haws' Merchant Fleets; Anderson's White Star; de Kerbrech's; The Shaw Savill Line; Moss and Hume's Shipbuilders to the World.